It's Thomas Jefferson Day (and Butch Cassidy's birthday too). We're marking all the occasions with our usual weekend open thread poll. Talk about anything you like — the fragrance you’re wearing today, the fragrance you're thinking of pre-ordering soon, whatever. 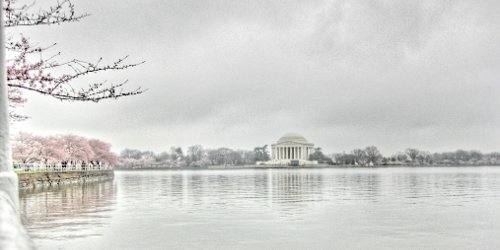 Note: top image is Jefferson Memorial, Tidal Basin, Cherry Blossoms [cropped] by Katherine Bowman at flickr; some rights reserved. What a beautiful and calming scenery, where is this Robin? It’s a dreadful, cold weekend with strong wind, I actually regret I already packed my winter hats and warm gloves back into the wardrobe depths. I’m wearing Atelier des Ors Cuir Sacre, helps with feeling warmer a bit. It’s the Jefferson Memorial in Washington, DC! Yes, and you can find lots of pictures of it from early spring, when the cherry blossoms are out. Inside is a large standing statue of Thomas Jefferson. But adding, in this particular picture they have greyed out all the color except the cherry blossoms! It does not usually look like that. I’m predicting snow for Easter…stay warm! That happens to me, too in Spring – inevitably I pack away my woolies and it gets cold again. Yep that’s DC (my hood). Adding to Robin’s comment that it doesn’t really look like that during Cherry Blossom time, because there are throngs of people everywhere. It is something to behold, though! Allergies? Germs from the kids? I don’t know but I am wiped out. Eeek. I hope you feel better soon! Oh dear! Hope it passes with some rest. So sorry to hear this, and wish you well, hoping you’ll be much better soon. Keep cosy and give yourself permission to relax and look after your own needs first. Get well. My husband has come down with something similar–he is totally wiped out. Hope you get lots of rest and it passes quickly. So sorry to hear it, hope you feel better soon! Sorry you’re not feeling well. Hope you’re doing better at this point in the day. Sounds like what I have – I can’t explain or “justify” how bloody tired I feel, it’s just a cold dammit. But it has knocked me out! I hope it passes quickly. No fun to be sick in the Springtime. Now I will cover myself in the scents of a garden! Off to work the community garden we go on this beautiful spring Saturday. I have been reading biographies of the founding fathers lately. Hard not to have mixed feelings about all of them. I think we have them on such a pedestal that we forget that they were very human and still products of their time. Wonder what they would think of the world now. Ditto this. It’s easy to judge two centuries later. I wonder how WE will be viewed two hundred years from now..? Yes….I too wonder how we will be viewed in the future….. excellent point, Deva. It’s hard to look at things that happened even 50 years ago. We are looking at any event in the past with 21st morality. I wonder what the Founding Fathers would think with what is going on today. On the one hand, yes, but on the other, they were judgmental about each other’s morality at the time, on issues that we are still struggling with today. There is not much that I would say about Washington or Jefferson that wasn’t already being said about them then. More than thinking “I should not look at these events with my 21st century morality” I think “wow, it’s just the same issues all these years later”. That is something I have a really hard time with, knowing that we are STILL struggling with so many of the same issues 240 years later!! It’s also national scrabble day! And one more sleep till Game of Thrones! 2 days in I knew it was a mistake. I left. Which was a little scary but ultimately the right thing to do. After I came back from my 21 hour marathon trip to Houston, I interviewed for a 3 year project about 30 minutes from my home. I wore Bois de Iles EDP for that. Yesterday morning I had the offer. I could weep with joy that I don’t have to travel every week. This could be my very last project until I retire. I slept and slept with relief last night. Great news and kudos for recognizing the mistake and doing something about it! So happy for you that you got everything re-done so quickly! Very good luck on your new project. Thank you! Being in my 60s has been liberating in so many ways! Congrats on the job and peace of mind! I admire your ability to recognize that it was a mistake and to cut loose immediately. I’ve never been able to do that. The interesting thing is that time never ever changed my gut feel. It just sometimes took me years to do the inevitable. I’m sure writing this is somehow therapeutic. I hope! Good for you on going with your gut. Happy ending! Well done. A simialr thing happened to me thirty years ago when I started a high- paid, high-status job that I knew was not right after the first week. I am so glad I left rather than battle on. It changed the direction of my life. So glad you have a happy outcome. it is so much harder when we are younger, Kanuka. I love that last sentence: 61 days to Africa! I left jobs that were bad for me twice in my career, early on. I’m glad you were able to recognize the danger signs so early! Excellent news! Bravo to you on your courage to do what was right for you. So happy. So happy for you. And yeeessss to GoT! YES!! Team Jon Snow here. Yesss!!! Although I do have on a tank top that says, “I drink and I know things” a la Tyrion. Wow that’s quite a story, I am so happy for you, very brave of you to know that you must leave on day2 and just Do It! Is your next assignment in Africa, or is this a vacation? Holiday – Safari with my sister. I had a dear friend who once told me the path will unfold. GOT WAS GREAT!!! no spoilers from me. lips are zipped. Congratulations on getting the offer! I loved traveling all the time for work when I was in my 20s and 30s. But by the 40s and 50s… it became much more challenging. One of my favorite summer scents disappeared from US shelves when the company was sold – Eau des Minimes Cologne by Le Couvent des Minimes. Does anyone know if they still make it under a new name? I emailed the company – in French- but no reply. They are under new ownership, and they have replaced the entire product line. I do not think the new owners have US distribution yet. You can see what they’ve launched by scrolling through this tag, maybe one of them is Minimes under a new name? I’m a little sad that I gave my only bottle to my sister a few years back……..
I’ve basically started next week’s CP. I have a FB and a 20mL La Goutte Parfumee travel spray. I had breakfast with the Easter Bunny! Pics on Instagram @ hajusuuri! Although I e-filed my federal return, I had to mail things to 3 different addresses: 1) my payment 2) quarterly payment for 2019 estimated taxes 3) sale of assets (stocks). Ridiculous! At Sephora, I saw Flower Bomb Twist Perfume Oil in Vanilla, Rose, Musk and Jasmine. Has anyone tried these? Judging by the comments, these came out in 2017 but for some reason, I’ve overlooked them. They are supposed to layer well with each other! I actually liked the vanilla. You smell great! I have back-up rollerball decants of IG. The rollerballs don’t seem to have the tendency to evaporate like spray bottles, so I hope they are good to the last drop. And when I’m done, that Guerlain brings back IG in all its glory. Congratulations on negotiating such a complicated system. It must drive you crazy. Taxes are the bane of my existence. My husband and I have to file 8 returns to 4 different agencies in Canada and the US and we get audited every year by Canada because we claim foreign tax credits from the US. It takes a crazy amount of time and effort. So complicated and oppressive. I just finished volunteering at our city’s Eggstavaganza. There was some possible worry about severe thunderstorms, but they held off. I’m wearing L’Eau de L’Artisan today. Scent Twins today. L’Eau de L’Artisan for me, too! Sniffing and sampling Tihota and Dulcis in Fundo today. I tried Tihota before was not that blown away so I ordered a decant to doublecheck. 😉 it is nice…quite a bit of musk in addition to the vanilla. Dulcis in Fundo is new to me. A vanilla creamsicle with a little spice almost. I am feeling sad about Easter without my parents but grateful for my siblings and family, fragrant friends on NST and good perfumes. I hope you find some moments of happiness this tough week. Will be thinking of you. the first few holidays without your parents are hard. Be kind to yourself, spend some time with or talking with your siblings. My brother and I have our longest talks on holidays and our parents’ birthdays. Sending you hugs and warm thoughts as you navigate these holidays without your parents. Oh She-ra, the difference is profound when they are gone. Just this morning I flashed on my mom getting ashes on her forehead at assisted living. The only tincture is time. Next year there will be a bit more perspective, I promise. Good luck She-Ra. Maybe an unexpected wonderful memory will help balance out the melancholy. I know how you feel. Deva, I get those visits also. This Tuesday will be 12 years since my dad is gone. I find those visits so comforting. Bloody Wood by Liquides Imaginaires from a sample. For me it’s like a smoother Santal 33, but my husband, who only smelled the far drydown, commented that it smelled “nice”. A compliment from the husband is always nice. It is! But I could hardly smell anything anymore (even with arm pressed against my nose), so now I’m worrying that he actually liked the “absence of perfume”. Though I rarely do more than two sprays. It’s rainy, cold and dreary, which is what I was expecting for Washington weather. This called for a nice warm spice of a fragrance, so I’m wearing Saffran Troublant. In other unimportant news, my ankle is feeling a lot better finally. It’s been bothering me for weeks and I’ve been gimping around like a 90 year old woman. One shift at work almost had me in tears. Ugh! So, still a bit sore but thankfully, able to walk like a a normal bi-pedal! Keep wafting through the world, fragrant friends! Glad your ankle is feeling better! It stinks when you have to be on your feet all day and something is hurting, I had some plantar fasciitis going on a of couple years ago, so I totally get it. Do you know what you did? Or what is helping? Glad you’re ankles feeling better! Glad to hear the ankle is better! I’m happy my shoulder is better too. Finally I think it was entirely caused by stress. Ugh, I’m glad your ankle is feeling better now. And you smell great! Woke up super late today because I was so tired. Ninety eight percent of the major stuff that I have been working on is done and it was super stressful. The last thing, I must wait until Wednesday because I have to work out the finer financial things. Did some cleaning and man, my dogs are really shedding. I am awash in Dia pour femme body products. Glad a lot of the stress should be over for you. Our pup is shedding so bad right now too. Started the day with VCA Bois d’Iris, which I just love. It seems to have faded so I think I’ll top it off with Box of Eels for the afternoon. This made me wonder if there’s ever been a cp- wear your favorite “Bois” fragrance…? I was up early and braved the cold (32F🥶) for the first Farmer’s Market of the year. The vendors were somewhat sparse, but so were the crowds=bonus. I’m glad I went because the sun was out in full force and now it has clouded over. In other exciting news, did anyone else watch the Star Wars trailer that dropped yesterday!?! I know what our family will be doing Christmas Day, just as we did in 2015 and 2017. Both times the mayor has been there with his family, lol. I love your idea to wear a Bois perfume for a CP. I can’t even imagine how many I have in my collection. I love going to the movies on Christmas day! You smelled perfect today. Love that one so much! Aw, Tom P. Miss that guy. I love the idea of a cp “Bois” perfume day. VCA Bois d’Iris. I am still scentless because I just don’t have much with me here at the rehab place and nothing struck me. Also I began to develop a horrible itchy skin rash earlier this week and have had to keep taking antihistamines to hold it off. Nothing was different except that I’d applied Le Labo Santal 33 so now I’m wondering if I could possibly be allergic to it. When I think of what’s at home that I’d like to put on right now, I come up with the answer “Tyrannosaurus Rex.” Kind of an odd one and maybe not the best bet for a nursing home…. so I’ll do without. Anyway I’ve done my Physical Therapy, which is demanding, and now have a pile of papers to grade…. enough procrastination, I guess. Calypso, I am thinking of ordering one of those zoologist sample boxes. I definitely want moth and T Rex but am not sure of what else…any suggestions? I am wondering about Rhino and Nightingale but don’t really know where to start. I’d recommend Bat, Civet, Camel, Moth and Elephant. I wasn’t that keen on Rhino, though I think some people were. You might want to read the descriptions to help you decide. Bat and Civet are among the most unusual and striking. Elephant is a very nice juicy green scent, with aspects that grow on you after awhile. I get Nightingale and Hummingbird mixed up. One of them was way too sweet. The other was pleasant but just didn’t rock my boat. I just checked, and Hummingbird is the too-sweet one. Almost everyone likes Camel, which is akin to a Serge Lutens fruit and spice perfume, but not overdone. Moth is near the top for me. It’s got smoke and honey, plus some flowers and woods. I find it very complex and interesting. Hope this helps! have fun! You are a champion. Thanks heaps. If you like T-Rex, you’ll almost definitely like Camel. I LOVE CAMEL! I also really like Civet, even though I’m not into animalics. I highly recommend against getting Bat unsniffed unless you have friends you can pass it onto if it doesn’t work out for you. It’s…definitely something. Calypso, do they have you on any new/different medications or antibiotics at rehab? I’ve got the same pain medication as before (in hospital) but it’s now at a reduced dose–I assume because they think the pain should be decreasing and don’t want me to become an addict. I also have those stomach shots that are to prevent blood clots. No antibiotics, no, not since the surgery when they were given in IV. Good luck at the rehab. Stay strong now. Often when the worst is over, the doldrums hit. Missing your own home, bath, things…Soldier on, we’re rooting for you. Thank you very much. I am trying to sort out my mother’s situation as well, and that prevents doldrums for now since there’s a lot going on. We’re moving her into assisted living in this same senior complex and I’m ordering a lot of furniture, lamps, etc. on-line, since it’s not furnished. I think once she gets moved and I get discharged, and go home, THEN the doldrums will hit, since I’ll be facing about 2 months without being able to drive, having to use my walker full-time, etc., and trying to finish out the semester at the same time while figuring out how to get groceries and take care of kitties. I will have help, but the reality is likely to hit then. For now friends are really coming around to help but after awhile, naturally, that will get old. We will hang with you, Calypso. I had surgery once that kept me flat for 10 weeks. The Sopranos got me through it. A most excellent day ahead: I’m off to get my hair colored, go grocery shopping, and then back out for a late afternoon pedicure. I have a tiny sample of Fleur Nocturne and really enjoyed it. Almost bought a small bottle but … too much perfume. Thanks for the mini review. I’ve been curious about this scent for some time. Sounds like I should try it. We had one of those perfect autumn days yesterday. The sky was the clearest, brightest blue, not even a murmur of wind, a crisp morning and the trees yellow, the berries red and the sea blue. A landscape in primary colours. Robin, I wonder if your holly tree has flowers yet? Keep an eye on it ….the holly treesinthe graveyard have perfect Christmas card berries. We get a lot of moths at this time of year. I just went to look, and no, no flowers! We have a camellia with its first flower ever (planted 2 years ago) and our magnolia is still spectacular. Daffodils are almost over but we do still have lots and I am bringing lots of them indoors since it’s one of the few flowers that doesn’t bother my son’s allergies. My little girl and I went on a perfume sniffing expedition in London on Wednesday, we went to Jovoy, Les Sentaurs, and even did some tea tasting at the Easy India Company, and random blossom sniffing in well in the well to do residential areas around Sloane Square, sprayed some of the new Jo malone Orange Blossom hair spray In her hair, which was really lovely. Sampling MFK Feminine Pluriel, from Les sentaurs- very pretty, but I’m covered in this category by Jour D’hermes Absolue, and AG Quel Amour! Your day sounds so wonderful. How lovely. The first time I ever smelled Jo Malone was at the Sloan Square shop. I fell for Orange Blossom and White Jasmine & Mint there. I remember going to a fabulous three story bookshop nearby, too. Wore L´Eau de Rien, as the weather was cold and drizzly today. Spent the day watching Star Trek and cooking a curried soup with sweet potatoes and parsnips. I love L’Air de Rien, you smelled wonderful. One of my favourites too, and you’re soup sounds delicious! Mmmm your soup sounds delish. I’m wearing Keiko Mecheri Gourmandises today, which is a very happy, jammy rose with hints of saffron. I think it could use more saffron, but I am a saffron fiend, so I have no objectivity on that score. It’s been a busy few weeks, with more in my immediate future. Trying to stay calm and quietly upbeat while dealing with all the craziness. Thinking about all of you out there, smelling so fabulous in your individual clouds of fragrance, puts a smile on my face. Curious, do you have a favourite saffron perfume, or several that you’d recommend for us to try? My favorite is probably L’Artisan Safran Troublant. I also like L’Aromatica Kulfi, Keiko Mecheri Gourmandises, and Agent Provocateur. There are likely more, that I can’t think of right now (I’m pre-coffee). I love jammy roses with saffron. I should at least give it a sniff! KellyC, send me your details, and I’ll put a sample in the mail for you. You can reach me at lisadarty in the land of the hawt mayle. I’m wearing DSH Café Noir this morning, it started out nicely but now I’m just getting white musk and it’s giving me a headache. I had to get out early to a community shred event, I got rid of tax and home refinance papers dating back to 1999. Now that drawer in my desk is a little more organized. Also last night I put down a deposit on a culinary trip to India with a tiger safari added at the end. I am not terribly interested in buildings, so no temples, mosques, churches, or palaces for me–I like food and animals when I travel. Indian food. I am jealous! It is going to be an overload of deliciousness. Wow, that sounds fantastic! I didn’t know there were such trips! Someone mentioned Datura Noir on here yesterday so I dug that out. Made the right decision. I love that one! In fact I love datura in every shape color form! Hey twin. My new bottle came in yesterday so I joined you. It’s perfect for spring! Daturas are such strange and wonderful flowers. We have the tiniest Datura plant in our front yard that only bloomed once (a pale yellow bloom). I think it is very unhappy–probably not enough sun where it is set—My fantasy garden has lots of Datura. I had to look up jimsonweed. I see the similarities in the flowers with datura. Maybe I should try growing the weed in my yard, since the datura is so miserable! Commando by this time, although I put on some La Labo Baie Rose 26 Chicago earlier today. I am going home after my singing debut! My choir had a concert today. I think we did well. I hope you had fun at your concert! Well done!, what a lovely thing to be part of! 31 Rue Cambon from the swapmeet, a 2 hour training for a volunteer organization (1 hour round trip to the site) and now I’m have some carne asada at our favorite local Mexican place. Hubby and son drove to Bucknell to watch a friend compete in a track meet and check out the campus. They will be back tomorrow evening so some DVR catchup tonight. Yay for carne asada and 31RC! It’s still cold and damp here after our snowstorm earlier in the week, so I brought out a perfume to warm me up – Les Nereides Opoponax. It’s definitely working! Today I did some sniffing of new scents I have been wanting to try since their release. I managed to get a sample of the newest member of the Hermes Jardin line… Sur la Lagune. Starts out with a lily/white flower scent – the most floral of all in the Jardin series. This lasts for a while then I start to notice the marine and woody notes which I find quite generic. The dry down convinces me I have no interest in this whatsoever – there is a very similar bitter, sour note here that I disliked in Eau de Citron Noir. I have to say the recent releases from the house have been Her-meh! Now on to what I did like… Guerlain AA Ginger Picante. Yep, my kind of scent. If you like Roger & Gallet Gingembre, Origins Ginger Essence, Hermes Voyage, or the Aqua di Parma Blu Mediterraneo line, you will probably love this. Best Aqua Allegoria in a long time. Unisex for sure. I just might get a bottle. I had a chance to try Sur La Lagune, too. I had a similar olfactory experience. A nice floral lily at first, but soon it seemed to wilt into what I call “pond water”. I really wanted to like it. The Ginger Picante sounds gorgeous! You guys, this vintage Dioressence I’m wearing today. Talk about the platonic ideal of perfume. It’s amazing stuff and courtesy of a swap with the exceedingly generous flopper. I smell very glamorous in my lounging clothes. It’s been a very chill day. I woke up not feeling great with a stiff, achy neck and more sinus pressure, but I’m feeling a lot better now. My boyfriend made waffles with diced apple, cinnamon, and maple syrup compote and some fried eggs. Oh my, it was delicious. I also finished the book I’ve been reading, The Girls by Emma Cline. Took a nice, long hot shower to help my sinuses and used a moisturizing sheet mask after to treat dry skin that’s been persistent this year. Just ate a late lunch of chicken salad sandwiches we walked to get and now just plan to relax and watch a couple movies the rest of the day. Your day sounds fabulous, particularly the mask and the breakfast! Jealous of your Dioressence, and your breakfast! Sounds like a delicious day all around, except the sinuses. I treasure my bit of Dioressence! Another day of Kondo-ing the condo: hauled 8 large trash bags to the local charity shop and stained some boards & bought parts to construct the sleeping loft we are building in the spare bedroom, which will be my husband’s man cave and occasional guest room. I am hoping the fact that it is a platform bed requiring the use of a ladder will discourage most would-be guests. Congratulations on the kondo-ing. That’s so great, 8 bags gone! It sounds so liberating. I really need to go through my closet, again. I heard somewhere that you only wear 20% of your clothes, so that would mean that 80% could probably be gotten rid of. I love kondoing – good job! I am much more blatant about discouraging guests: The kitty litter box is in my guest room. Most kitties believe they are meant to be well treated guests, so this might be the perfect spot! I bow to your evil genius. Wtg on the tidying up! I so need to Kondo my house. Oh, and I wore Profumum Fiori d’Ambra. I’m testing out the new Hermes Jardin sur la lagune perfume. I don’t usually like powdery florals at all, but this is pretty good so far. It’s been a whole day and I don’t hate it. The snow finally melted enough and I was able to get my car in the driveway. It’s been a good day. Hope everyone is having a good weekend. Nice to lose the snow! Sounds like you liked Lagune better than most. I am in Gucci Bloom thanks to sephora visit. I like this so much I really should just buy a bottle. I will wait to smell their new flanker first though. I was browsing Demeter’s site to relax and thinking of getting a few samples. Any favorites anyone? I saw a bottle of GB heavily discounted at Marshall’s the other day and thought about buying it blind. This just to say that if you wind up wanting to scratch that itch, maybe check out a few of the discounted perfume sites. You may get a great deal. And just while I am nattering away–I have not tried many Demeter’s, but among those I liked were Dirt and Tomato. I liked Dirt an awful lot. And Sawdust, as well. Dirt and sawdust are not two notes I gravitate to so I doubly appreciate the recommendations! Oh, and if you like earthy, Beetroot! I wore Chanel 19 EDP to a haircut appointment this morning, and am now enjoying its far drydown and a Manhattan cocktail while catching up with the NST universe. It’s been a lazy day, apart from waking up far too early this morning. I’ve been re-reading a series of Phryne Fisher short stories – lots of fun, and they wrap up quickly (which is also fun). You smell great. I love Manhattans. Do you like the TV versions? I love them. I’m rather fond of her police detective boyfriend. I love the tv series! It takes a bit of liberty with Inspector Jack Robinson’s character, though – in the books he’s far less dashing and darkly romantic. And there’s a Mrs. Butler in the books, where in the television version she has passed away, but in compensation Mr. Butler gets a bit more personality. A pretty chill day. Worked out, had lunch with the hubs, cleaned the house. Nacho is doing fine from his surgery and already back to his normal self. Finally watched Crazy Rich Asians and really liked it. I’m trying Civet today. It’s defintely more wearable than Bat and I could see wearing it a lot in the cool weather. Definitely not something I’d recommend blind buying but I like it a lot! Oh yes, he is haha. Totally forgot to mention him. But no fever since Friday so I think he’s definitely on the mend. It was rough Sun-Friday though! Civet and Camel, for me were the easiest to wear among the Zoologists I have tried. In fact, I have even craved wearing Civet on a few occasions, but have not been worked up into a FB frenzy. I’d love to try Camel and Elephant. I’d be happy with a travel spray of Dodo and I will probably get a bottle of Chameleon. I like Civet and Bat enough for a travel spray but that’s all I’d ever need of either. Highly emotional day on Friday – met (for the first time in more than 40 years) the son of a couple who were my late parents’ best friends when we lived in Dublin & later in the day a friend whose garden backed on to ours & we were playmates! Wow, your Dublin trip was a serious journey down memory lane. How wonderful to reconnect with such significant people from your childhood. Indeed it was, which is why it was best as a solo trip – husband would have been a tad bored! He would have appreciated the marvellous foodie scene that abounds here, though. I had a similar experience in Brown Thomas a few years ago. That does sound like a lovely, but very emotionally draining day! Not just me, then, with Brown Thomas! You’re so right, lovely but emotional, as was today when said friend, his younger brother (who was my brother’s best friend from our time there) & I went to visit their parents’ grave so I could pay my respects & leave flowers – found dusty blue thistles on a flower stall in the main shopping street, which I was thrilled about as I didn’t want to take ‘supermarket flowers’ – appropriate, I thought, as I was born in Scotland & live there again now. The ‘boys’ seemed touched by the gesture, which was all I wanted. I love Dublin so much. So wonderful you got to see old friends and pay your respects. Yes, it was well worth making all the necessary arrangements for what I wanted to achieve this visit. What a heavy day on Friday, like time travel. Do you think you’ll get more Privet Bloom? Difficult day at times, but very rewarding. I’d love to get more Privet Bloom – Space NK used to stock it in the UK, my nearest shop (150 miles away!) shop being in Glasgow, but they don’t any longer. Other option would be to have the company send some to the friends in Texas we’re visiting at the end of May – haven’t decided, as I am quite well off for fragrance at the moment & don’t use nearly as much as I used to prior to retiring! Hi Carolyn.. Thin Lizzy fan here, too, along with the greatest of the greats (to me) Rory Gallagher! I miss Dublin so much. I traveled there a few times on the way to see my friends in Wales, and while I worked in London a long time ago. I had to look up Privet Bloom; I’ve not heard of that. The notes sound really beautiful. Sounds like a rewarding, if emotional visit. Hello Bronyraur – thank you for your response. My husband is a big Rory Gallagher fan too. Yes, Privet Bloom is gorgeous. – just wish it was easier to source! You’re so right – rewarding & emotional, a day to myself on Saturday was welcome. Game of Thrones is finally back today and yes, I’m unreasonably excited. I have on CdG Black for Castle Black (yes, I’m a nerd). Headed to visit with my 3 years old nephew for a little bit. Ever since he was a baby I’d say, “Give Kelly kisses!” And then I’d kiss all over him and say, “Best friends!” So now when he sees me he grabs by head for me to kiss him and says, “Kelly kisses….best fwiends!” It melts my heart! Well, my heart is melting a little just imagining it…. My sister came to visit and it’s been a big day for trying perfume. I tried her D&G the only one as I was intrigued by the coffee and violets combination but I only got violets and amber on my skin. I liked the smell but it didn’t last on my skin! Then I tried Marc Jacobs honey and I hated it. I love the smell of honey but I found the perfume itself too screechy. Started out the day in 7 Virtues Middle East Peace. While my parents were at church, I worked on a project of sorting out samples, putting them in plastic bags, and labeling the bags. Mom poked her head in my room when the parental units got home from church, but quickly withdrew from the combination of scents I’d gotten on my fingers and apparently in the air around my desk. After my bath, I tried L’Artisan Tea for Two — thanks for the samples, swapmeet folks! I like it, but I think it’s too smoky for Mom and Dad to deal with in the house. I changed to Tommy Girl. I’ll probably switch to a lilac or lavender fragrance when I get back in the house after wandering around the gardens. The bees are very eager to find flowers, and I don’t want to be mistaken for one. The ‘Pocahontas’ lilac in the backyard is in bud. The winter honeysuckle is still blooming, and the bumblebees are lively there. Whatever tulips don’t get eaten by rodents or deer or rabbits should be blooming soon. Very bored now of being tired and unable to smell anything. (Yes, that interminable cold is still hanging around, now gone all chesty and phlegmy). SOTD is Boucheron “Jaipur pour homme”, since if I can’t smell what I’m wearing I may as well wear something I don’t care about. Today I made us a curry with onions, carrots, beetroot and chickpeas which was delicious with spicy chicken on the side. And I just had to get out of the house, so TOMK and I did a circuit of the nearest local parks, which was pleasant in an everyday sort of way.